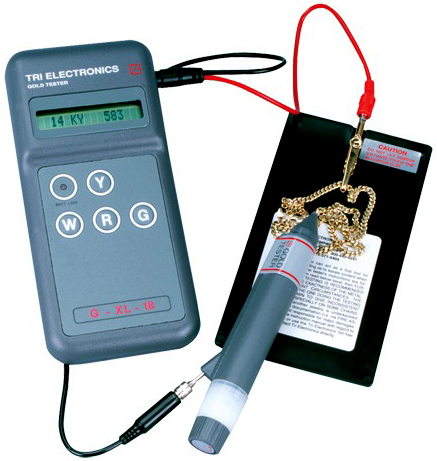 * GLX-18, by Tri-Electronics will measure white, yellow, green and red gold and platinum in seconds without using dangerous and messy chemicals. * It will test from 6 to 18 karat with an accuracy of 1 karat. * The GXL-18 displays results in the alpha numeric LCD display in terms of actual karats and percentages of gold content (for example 14K-585). It will also display "Platinum" or "not gold" when applicable. * There is no need to look up any conversion tables.